Being raised by an artist has both its advantages and disadvantages. One of the major disadvantages is that my mother made me into an art snob at a very early age. Some of my first memories are of my mother taking her college art history books off the shelves to read to me. I would sit with her on the sofa and listen, as she taught me about negative space, focal points, color wheels, contrast, movement, texture, and perspective. When we would go to museums or art galleries, she would ask me to apply what she taught me to critique the works of art. Every instance my mother heard the “Don’t judge a book by its cover” phrase, she would recoil in disgust. In her opinion, if someone put enough effort to make a book cover visually appealing, then the content of the book is worth consideration. Needless to say, when she took me to the bookstore as a child, I was encouraged to utilize book covers in order to decide which books I wanted to bring home. 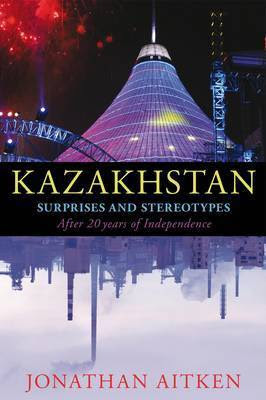 I bring up this topic as an introduction to my book about Kazakhstan, “Kazakhstan: Surprises and Stereotypes after 20 Years of Independence,” by Jonathan Aitken. Needless to say, when I saw the cover of this book come across my computer screen, I wanted it. It features a photograph of the purple and green lit Khan Shatyr, which is a recent shopping complex described as “the world’s biggest tent.” This is located in the capital city of Astana. Although this book is described as a book about Kazakhstan, I found the book to be more about its President, Nursultan Nazarbayev. (As some background information, Nazarbayev has dominated the political sphere in Kazakhstan since before the fall of the Soviet Union. He has served as the country’s President ever since the country gained independence in 1991. In the recent elections of 2011, he was re-elected with over 95% of the vote.) In fact, the author actually wrote Nazarbayev’s biography entitled “Nazarbayev and the Making of Kazakhstan.” In my opinion, he has a difficult time separating the country and the people from its political leader. There is not a chapter in this book where Nazarbayev does not play a central role. The author also seems to be somewhat biased through his support of the Nazarbayev government. While I understand that his opinions constitute a legitimate point of view, they never seem to challenge the leader’s actions. One example of this includes a passage on page 96: “There are over two hundred daily newspapers and magazines published here, many of them hostile to the government although rarely critical of the President personally, a prohibition which is enshrined in the constitution.” The author finishes the paragraph with a quote from the chairman of a Kazakh journalist association, stating that they do not feel as if freedom of the press is violated through the current set of laws (an assertion, which as a US American, which I have difficulty believing.) The author often talks about the support of the President among the Kazakh people, but never shares the alternative voices in the country. While I will not criticize Jonathan Aitken and the material which he chose to cover, I do believe that there were more opportunities to share alternative voices in the book. The author states that there is a diverse population in Kazakhstan, but instead has covered predominately the life of one – that of the President Nazarbayev. Nonetheless, I did learn a lot about Kazakhstan from this book, as it covers a wide array of political issues. The most interesting chapter was entitled “Nuclear Past, Nuclear Future.” This particularly delved into the issues of the Soviet’s nuclear development program. In short, “throughout the nuclear arms race of the Cold War era, Kazakhstan became the Soviet Union’s weapons laboratory. Between 1949 and 1989 tests took place at the rate of one every three weeks. There were 752 explosions, 78 at ground level, 26 in the atmosphere and the remainder underground” (page 76.) As one can imagine, these tests had effects on the health of many of the Kazakh people. When Kazakhstan gained its independence, it found itself “custodian of over 1,200 nuclear warheads for Intercontinental Ballistic Missiles (ICBMs)” (page 78.) The author later notes that this number is greater than the number of warheads controlled by Britain, France, and China combined. Nazarbayev was the first President to “voluntarily renounce the possession and use of nuclear weapons” (page 75), an action for which the author gives him significant praise. It is challenging yet very technical to read fiction from around the globe. I love fiction and I can read for hours to complete a fiction which has a captivating touch.